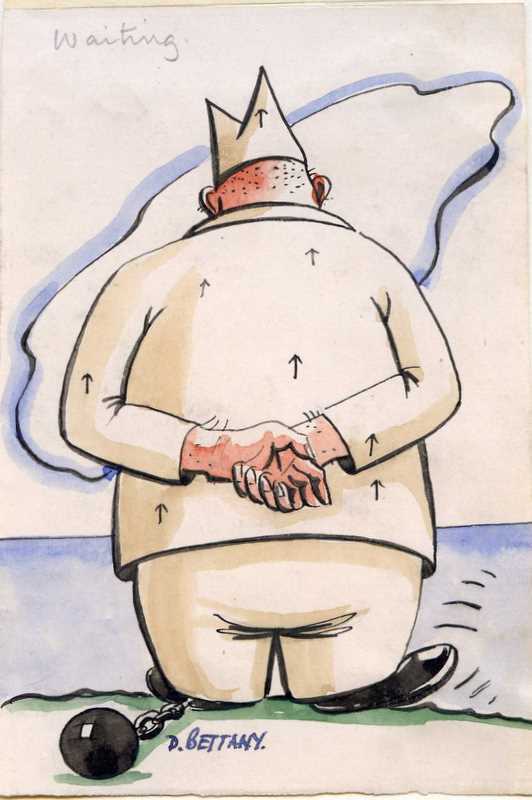 Again Des almost paints the ridiculous, a very well fed prisoner in cartoon western prison uniform, having nothing more to do than just wait for liberation, unsure whether it will be 6 months, 1 year, or several years. In reality, the POW’s in Singapore spent 3.5 years under appalling conditions, with nothing provided but a starvation diet of rice. On top of this many were suffering from various tropical diseases, or suffered vitamin deficiencies which caused their teeth to fall out and other serious life threatening diseases. They were however expected to work a 10 hour day with no protection from the sun or the torrential downpours or the dangers the jungle presented, let alone the beatings they received for no reason from their captors. An interesting aspect is that when Des’s son Keith gives presentations of the artwork, he has found it necessary to include in his presentation some actual photos of the ‘walking skeletons’ to bring the audience back to the reality of the situation, a reality that Des was escaping from in his mind by painting. We would call this Diversional Therapy these days and this surely assisted Des and many others who could see the humour in his images to survive. Des did give a lot of his work away to his mates and to date, many images have been scanned and returned via email to Des family. Some one has said that they (the cartoons) were as valuable as medicine, as it helped keep many a prisoner alive by giving them the freedom, even in prison, to smile.